The "snake" could be any number of things (roots, cable, pipes, irrigation tubes) but also "eel", "octopus tentacle", "giant spider leg"...or indeed strange geological feature. But when we get people to Mars we can investigate. If humans visit that location they can first of all determine whether the object is still there or not. If it has disappeared, that will be very suggestive. There are a number of photos taken by the Rovers over time where objects have moved or disappeared. Yeeess, but l will stay with a harp. And NASA knows all about Mars being more Earth Like than they let on, (they probably have a base there) so will stall in any way they can until the great exposure day in 2033, when they circle Mars, land on its moon and show the world the monolith. I suspect that Musk already knows this and it trying to get there sooner than that, but his satellite and rover should expose it all. And we will stop getting NASA's crap about "we won't check out the statue since we already know that it is not a statue"
How can they be so sure??? it is more like, we know that mars is inhabited, but will keep going with our BS deniability bender for as long as we have to". No explanation from NASA, it seems. 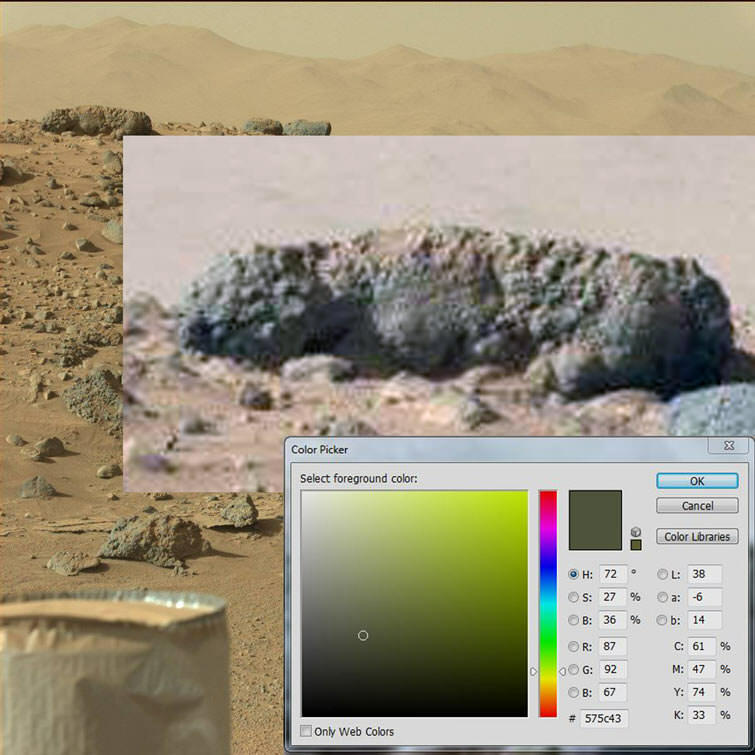 Even in the raw clip you can see that, whatever it is, it is of a different hue from the rock to which it is attached, suggesting it is not part of that rock. I would also say it appears to attached to the surface rather than being an integral part of the rock structure. This is yet another very intriguing photo. Yeah, no big deal, the first one is a bird, and the second, (l would love to say, scared hamster) but it is probably just the rovers reflection. Explanation from NASA, lol, in other words they are trying to come up with some more lies,to cover their as****. Unfortunately there are plenty of people that will buy it, (my UFO's are real thread is proof of that). 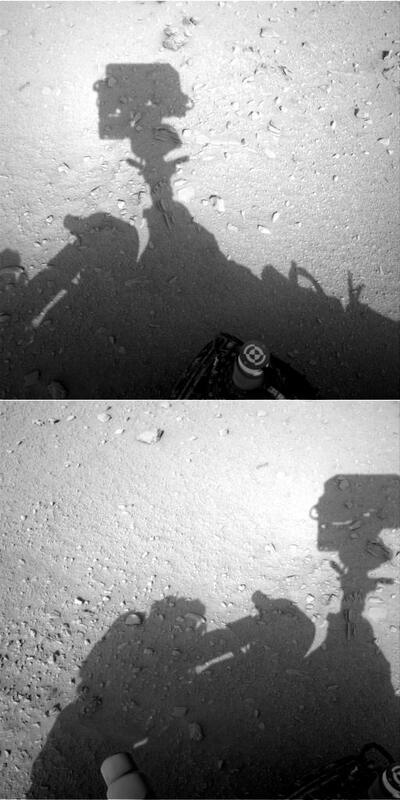 Yep, this puts the rock in one image and gone the next to shame, a human like person cleaning Curiosity's cameras. To my knowledge there are humans, lizard looking and Grays on Mars, (and a small outpost of us, or from Earth) and from what l have shown grays have long necks, and the lizard type race are camoflaged, and to my knowledge havn't bothered taking a closer look. So this person, has two small air tanks on, which means that this is Mars or the rover is not on Earth somewhere, has no helmet on, (you can clearly see his short hair) and a suit of some kind. So NASA is lying about the air pressure, lying about Mars being dead and lying about no lifeforms being there. 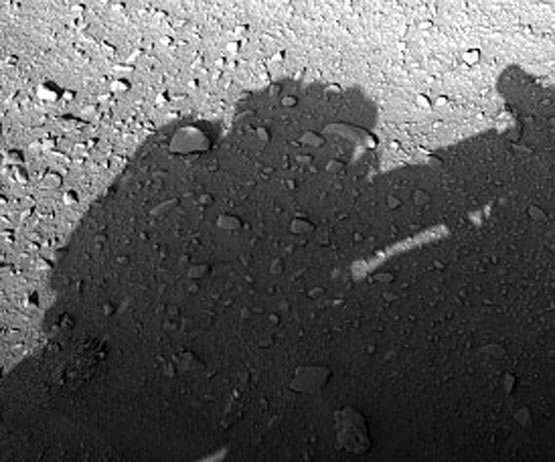 Mars is inhabited all right, and NASA cannot explain this one away! I would love to show this one elsewhere, but unfortunately the better the proof that stupider the explanations. 1) I am not inclined to trust picture evidence I see on the internet. 2) I am not inclined to trust Brits who are rumored to at times hoax stuff. Have either of you queried for Xenon 129 on Mars? First shows nothing and second shows something or someone. Curiosity has no hair or loose material on top, it is all solidly built, no fabric. The hair and the fact that it is in one image and gone the next, make this a slam dunk. The only way NASA can get out of this is saying that the camera had a technical glitch, that or say one of our technicians from Mars outpost one, cleaned the lenses. I think it's best to run with the sites that give raw images and links to NASA/JPL who put the photos into the public realm in the first place. Ok, l want to be fair here. But no, the blur and hair details can't be explained away as the robotic arm moving, (the tools attachment, only has hard edges). But it could still be the tools attachment further back, so l will say that it is likely. I would say extremely likely!!! More images of the river l glimpsed before, (mainly dried up). And more green stuff. I ran this through Photoshops color picker and got the greenish gray, or typical algae colorization. And since this is on top of this rock, and others, it is more likely due to rain fall, than an underground spring, especially when the river downhill is almost dry. 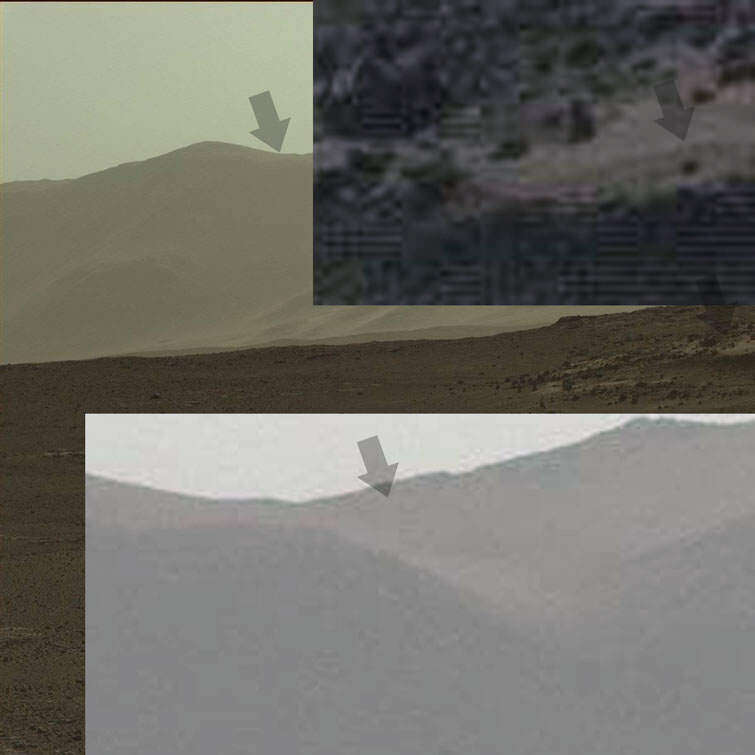 And this the middle one shows the structures l saw before, and top shows an obvious gray depiction in a silver building, structures in the middle and what looks like a silver building floating on this hill with a human face depiction. PS gee, Louis, l wish you would finish your testing? PPS just load your image into Imgur, (free account) and cut and paste the link, here). Looks very much like a rectangular image...but v. difficult to explain. Bears a passing resemblance to a mobile phone screen...Looks v. unlike anything you might come across on Earth in nature. Some other interesting artefacts also included - the embedded fossilised skull is rather difficult to pass off as pareidolia, I think. I won't attempt to put the image up (you'll be pleased to here, given previous efforts) but if anyone else can, then please do. Hate to burst your bubble, but the one this guy put so much effort into, is l believe is one of Curiositys, wheels, but the rock is concave or reversing the image, so the wheel is upside down. The other one, don't know, not enough info, to say? A pity this guy puts a lot of effort into his videos, but should scrutinize it more, or at least find something more interesting? Louis, can you please remove your test post. Well it's not my bubble to burst, but what do you mean "l believe it is one of Curiosity's wheels, but the rock is concave or reversing the image". What we are looking at is clearly not the wheel itself, so you seem to be suggesting it's a reflection of the wheel. But then it's a reflection either on a white rock that seems otherwise to be completely non-reflective of the surroundings or you mean it's a reflection contained within the rectangle of unknown material. If you mean the former, then you have to explain how the white rock does not reflect its other surroundings, yet produces a mirror-quality reflection for the Rover wheel. If you mean the latter, then you still have an anomaly: where does this very rectangular piece of material come from? - very rare I would say in nature - and also how it relates to the white rock in which it appears embedded or to which it appears to adhere. For the sake of clarification, I don't go along with everything these anomaly hunters say: there are many times they claim to see designed structure when we know from earth that such features can be formed by wind, water and freezing cycles on Earth. But then there are other anomalies that appear to fit better with designed or organic structures on Earth. So I keep an open mind. 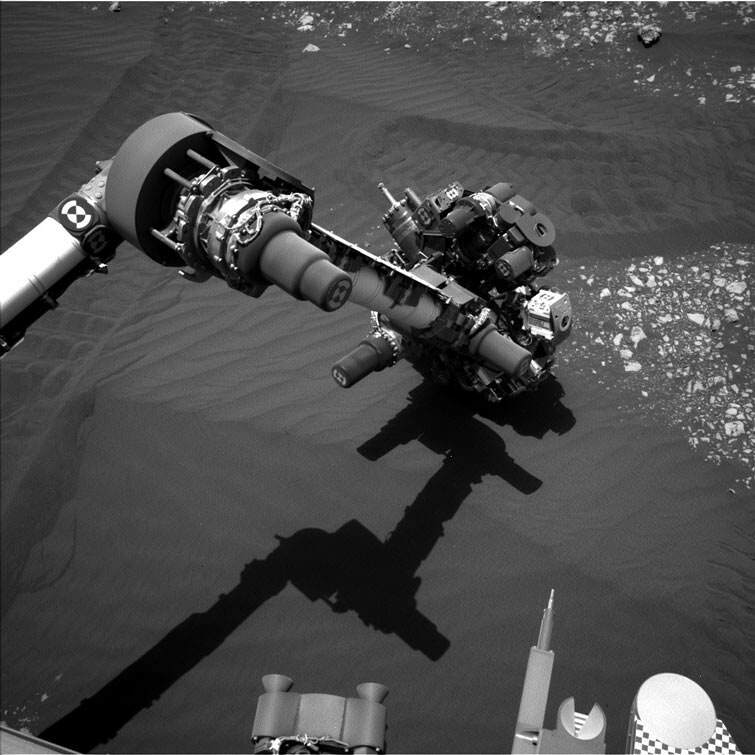 Just meaning that the rock is dish shaped, so the image of Curiosity's wheel, and arm are upside down. 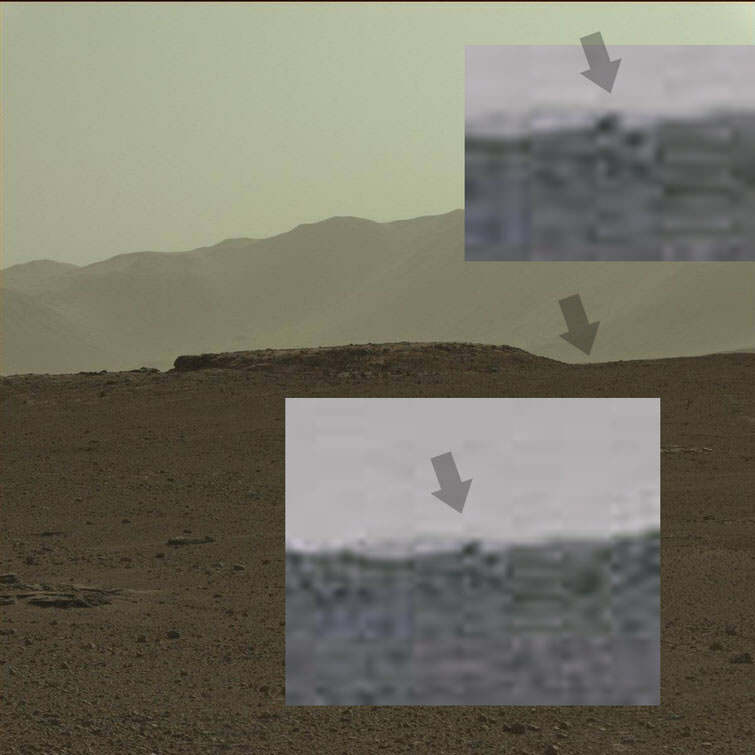 And sure that the rock next to it is not concave, as it is reflecting back the underside of the top part of the rover. Both rocks are reflecting back the landscape or mainly the sky. 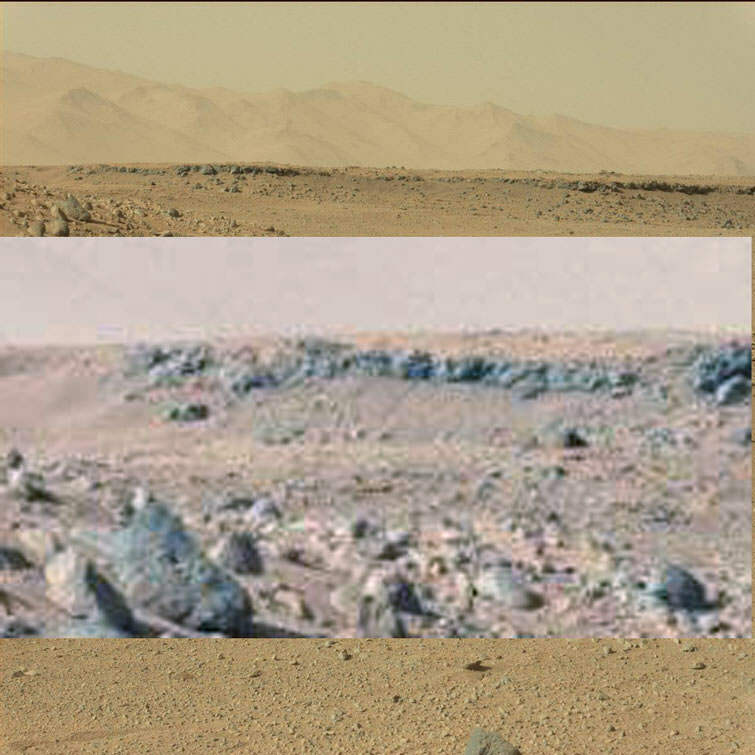 And sure that there are a lot of very reflective rocks on mars, probably caused by volcanism. Unfortunately when someone does a search on YT the top results are usually garbage, but the results on the last page or pages are usually more credible. This goes for pretty much everything world gov, want buried, (TY strips away the kw's effectiveness, so it sinks, while rubbish doesn't so goes to the top). 1. Define "dish shaped" and which "rock" you are saying is "dish shaped". Do you mean the rock/artefact with a rectangular-like image in the middle of it? 2. Be clear about whether you mean the whole of the rectangular dark image is the reflected wheel. Or do you mean the wheel is depicted as a reflection within the dark rectangle. 3. When you say "Both rocks are reflecting back the landscape or mainly the sky" do you mean you are not sure which they are depicting? Or do you mean they are reflecting both. 4. It helps if you can be more explicit in your use of the English language. Dish shaped as in the one with the dark rectangle on it. The dark rectangle is, (l believe) one of Curiositys wheels, and part of its arm connecting to the rover. The landscape behind the rectangle is mainly the sky. 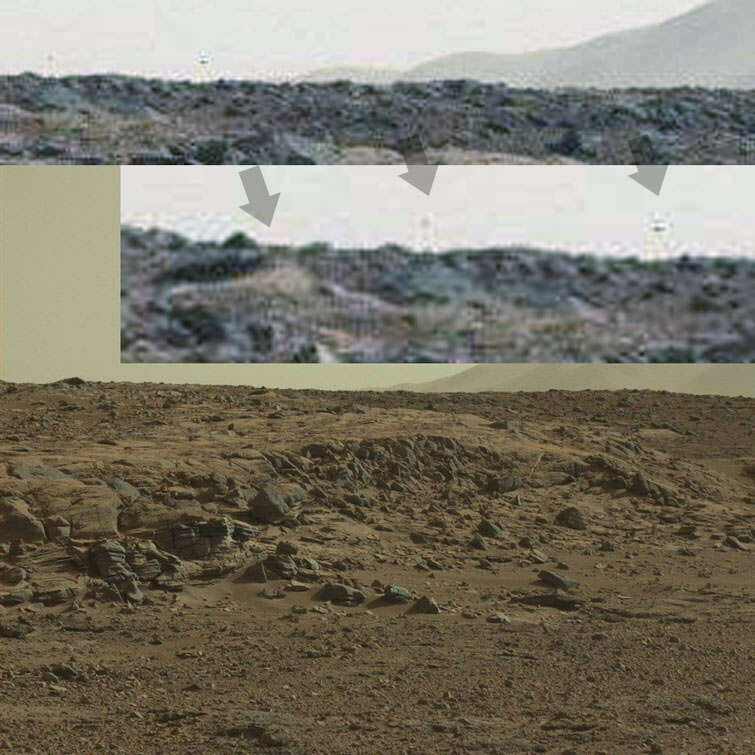 The sky and part of the rover, is also present on the rock to the right of this. I hope that helps Louis. And it is only a matter of time before the YouTube video l posted, (first post) is going to get the attention of closed minded dimwits. These tend to be individuals with big mouths and small minds, but l have dealt with drooling egomaniacs before so nothing new there. Throw solid evidence at them, (the UFO proof being one) and you get more and more stupid comebacks, not usually intelligent alternatives. 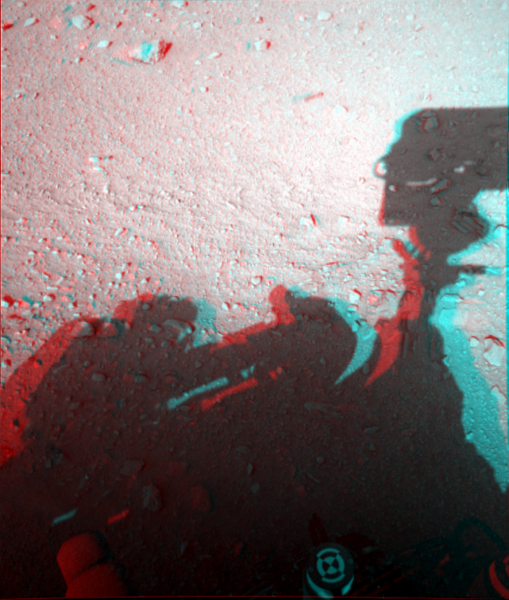 I made up a couple of anaglyph's from the left and right cams for some additional analysis, they may help. Thanks Mablion, but unfortunately it is probably just curiosity's tool edge arm, (ps l wanted it to be a man or hair, but it probably isn't). Just have to be happy with martian algae, and roads, etc, lol. PPS l am also too lazy to go and search for my 3D glasses. Ok, plenty of discoveries today, (never fails when NASA has dark images, there are always things to find). First is this on the mountain, looks like mist, which should be impossible according to NASA's air pressure idea. 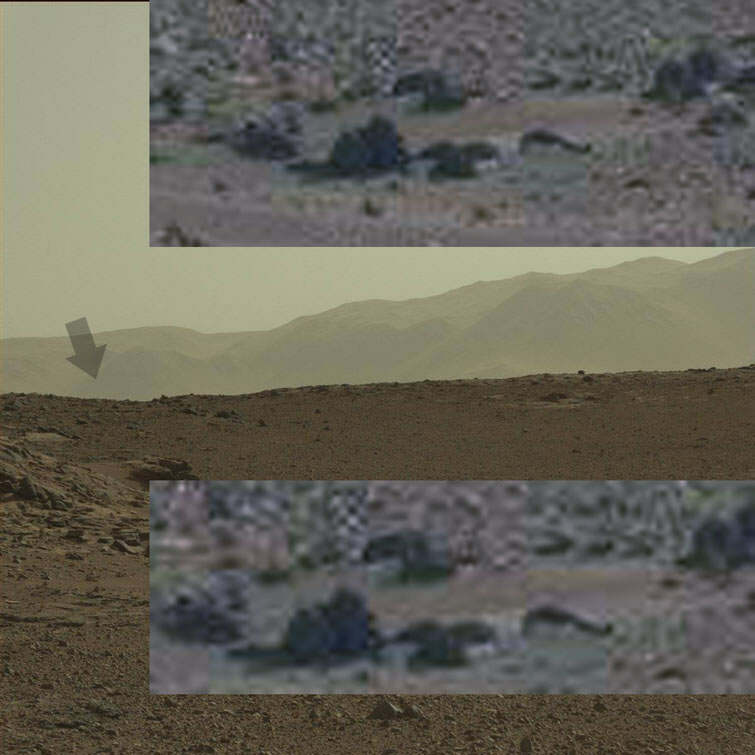 And the rover shown going up a hill in this distant reflective rock, (no dust behind it either, which add's more credibility to the mist idea). A reasonably closeup of a dirty pool of water, and yeah, there are hints of green. And this building in the distance, at least 5 km's away so obviously not the rovers reflection. And now the juicy one....goes without saying that if l did find a large bridge previously it would be going to a city or town? Looks like a city to me! I originally saw the road type thing on the left then spotted this. A pity the rover doesn't head in this direction, lol. Your welcome. 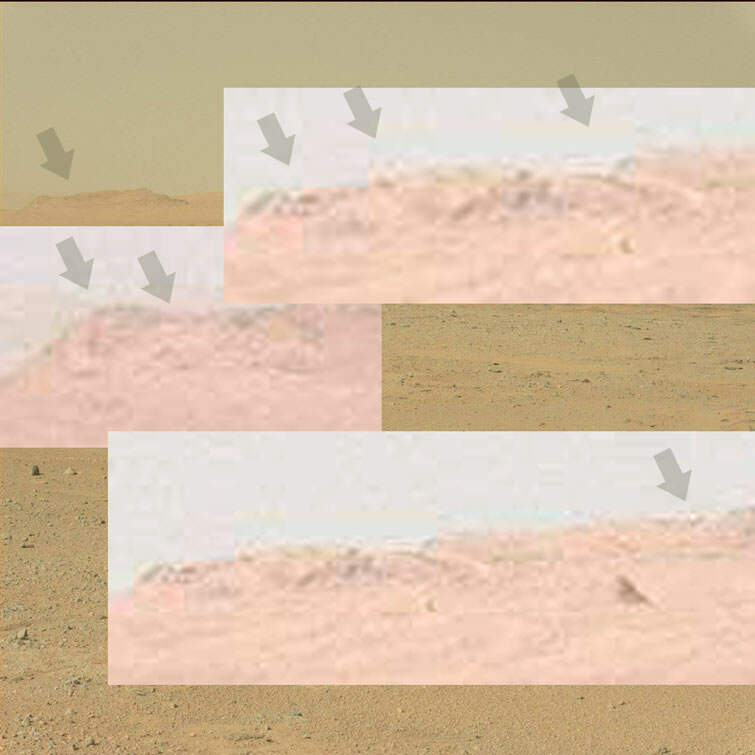 Btw, I see quite a few definite examples of "beak" type bird glyph's on Mars, "where there's smoke there's fire"! So it could be a flying creature of sorts. Looks like your'er a true researcher of surface anomalies. 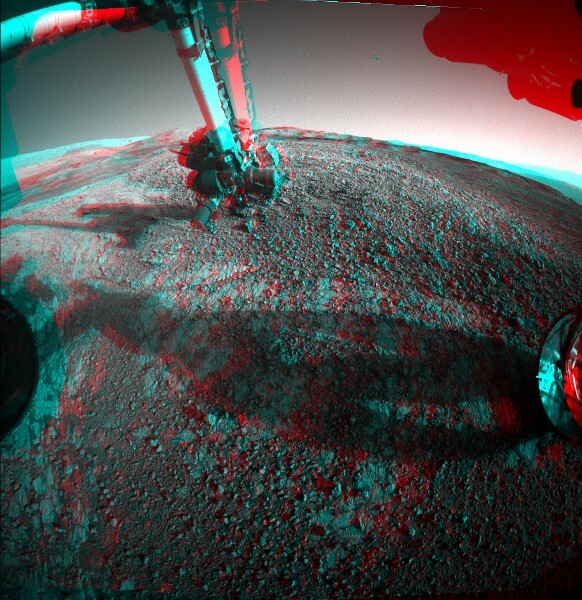 Seeing Mars in 3D will take you into another reality impossible in 2D. I produce all my own anaglyph's from the high def MRO images composed using "uncompressed .tif's" so there's no compression artifacts. The MRO captures pixels at around 25cm per pixel and can resolve to 80cm - awesome! If you wear glasses as I do, the flip-up's are the bomb and the price is right. If at all possible, could you provide a "source link" with your image postings? I go through the mast cam ones, bottom right hand side. Currently up to Sol 570.